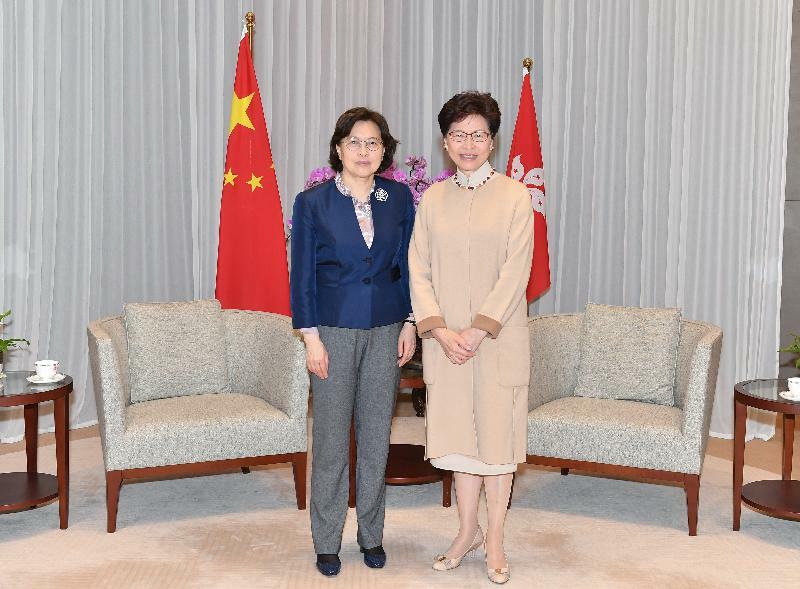 The Chief Executive, Mrs Carrie Lam, met the Vice-President and First Member of the Secretariat of the All-China Women's Federation (ACWF), Ms Huang Xiaowei, at the Chief Executive's Office this morning (March 21). The Secretary for Home Affairs, Mr Lau Kong-wah, and the Secretary for Labour and Welfare, Dr Law Chi-kwong, also attended the meeting. Mrs Lam welcomed Ms Huang's visit to Hong Kong with a delegation to attend the reception in celebration of International Women's Day held by the Hong Kong Federation of Women at Government House this evening. 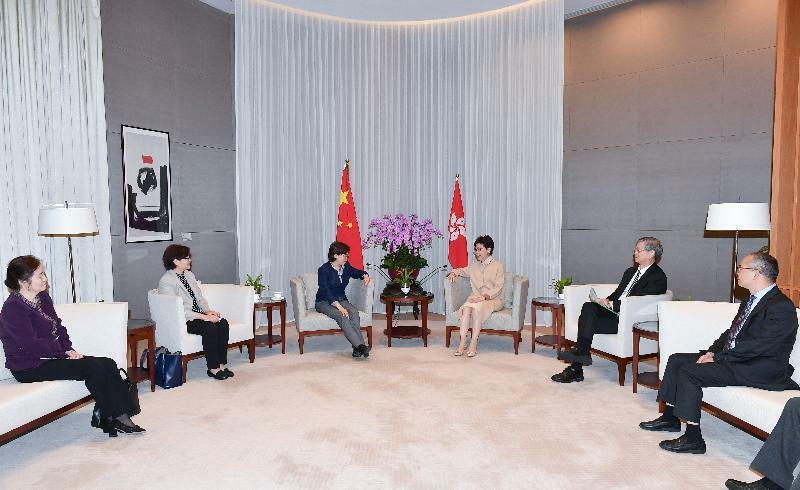 She said she was pleased that the delegation would visit a number of groups and organisations that promote the rights of women, youth and children to exchange views and share experiences with them during their stay in Hong Kong. Mrs Lam said that she, as the first female Chief Executive of the Hong Kong Special Administrative Region (HKSAR), has an important and huge responsibility in advancing women's development. She said that the HKSAR Government attaches great importance to and plays an active role in promoting various aspects of women's development. Recognising women's contributions to families and society, she said that the Government will, through a series of support measures, encourage more women to join or stay in the labour market to unleash the female labour force, allowing them to give full play to their potential. She thanked the ACWF for its support and care for women's development in the HKSAR all along and expressed the hope that the ACWF will continue to support the HKSAR Government’s work for the benefit of women.